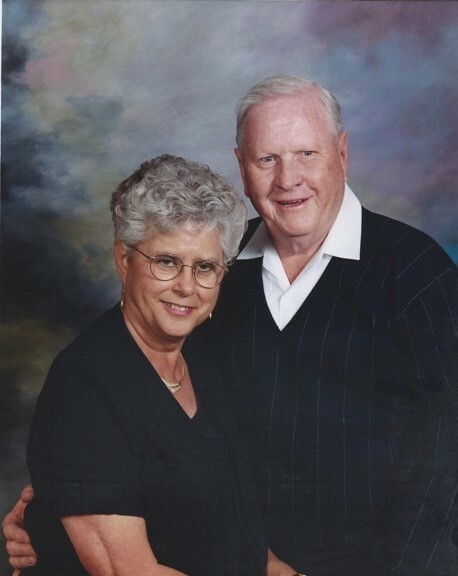 An eternal love story continues in heaven as William Ernest Henderson, who died peacefully at his home in Kalispell on July 27, 2018, joins his wife Mary Ann Henderson, who died on September 18, 2016. William was born May 28, 1930, the fifth child of six, to Ernest and Margaret Henderson. William grew up on the family homestead in Madoc, MT where he assisted his father in farming the land. He graduated from Scobey High School in 1949. Mary Ann was born January 3, 1933, the middle child of three, to Chris and Selma Veis. Mary Ann grew up in Scobey, MT and attended Scobey High School. She was a member of the band and graduated in 1951. William and Mary Ann met in Scobey, MT as teenagers. In their courtship, Mary Ann worked at the movie theater where William liked to frequent. In 1952, William was drafted, joined the Marine Corp and left for his basic training. Mary Ann followed closely behind and joined William in Tennessee. William and Mary Ann were married on November 22, 1952 in Memphis, TN. After finishing training, William was stationed in California where he helped educate pilots with flight simulators. In 1954, William received an honorable discharge from the Marines and they moved back to Scobey, MT to take care of the farm. For a few years, William and Mary Ann worked tirelessly to provide for a growing family by working the farm, running a clothing store and driving a school bus. In 1967, William and Mary Ann purchased the Vacationer Hotel in Kalispell, MT. After running the hotel for four years, William trained to be a financial planner with Waddell & Reed; and in 1971, they sold the hotel and moved into their final home. Mary Ann began working at Kalispell Junior High School as an office administrative assistant in 1977 and worked there for almost 20 years. William and Mary Ann officially retired in 1998 and they continued to live in their Kalispell home as well as their winter home in Lake Havasu City, AZ. William and Mary Ann were married for over 60 years with five children, 8 grandchildren and 4 great grandchildren. They were very active members in the church and attended St. Matthews Catholic Church for over 40 years. William and Mary Ann will always be remembered for the eternal love and devotion they had for each other. In the last few years of Mary Ann’s life, she had Alzheimer Disease that required professional care. William would not leave her side as he went to visit her every day until she passed. Mary Ann is preceded in death by her parents Chris and Selma Veis along with her brother Vern Veis. Surviving is her brother Larry Veis who resides in Phillipsburg, MT. William is preceded in death by his parents Ernest and Margaret Henderson, along with his sisters: Eileen Naughton, Jean Parker, Patricia Sanborn and Jackie Cavanagh. He is survived by his brother Thomas Henderson who resides in Billings, MT. William was preceded in death by Mary Ann and their son Dana Henderson. Surviving are Kenneth Henderson, wife Cindy and children Cassandra Lloyd and Angela Catanese; Donald Henderson; Linda DeVoe, husband Tony and daughter Melissa Phillips; Gary Henderson, wife Julie and children Lauren, Sarah and Andrew, Dana’s children Kaylee Henderson and Brooke Henderson. A Rosary Service for William and Mary Ann will be held at Buffalo Hill Funeral Home on Friday August 10, 2018 at 7:00pm. The memorial service will be held at St. Matthews Catholic Church on Saturday August 11, 2018 at 10:00 am, followed by a reception with the burial service at Conrad Cemetery immediately after. In lieu of flowers, please send donations to send St. Mathews Parish or Frontier Hospice.